Whatsapp mobile messenger is a mobile messenger messaging application that allows users to exchange messages from anywhere in the world for free. Whatsapp is a cross-platform app compatible with various mobile phones like Blackberry, iPhone, Android, Symbian and even Nokia S40 series. Most smartphone users today use Whatsapp for free messaging and the conversations are store in a log. Sometimes one may change phone and will want to retain his conversations from the old phone, so backing up your Whatsapp can allow you transfer your chat log from one phone to another. But today I want to show you how you can backup whatsapp conversations on a computer. The chat log contains all your messages and its contents be it videos, images, audio and texts. So for the purpose of this article, I will be using an iPhone and a Windows computer though you can repeat the same process with any smartphone and OS. Before you can backup Whatsapp conversations of an iPhone Smartphone on a computer, you may have to first root it to gain the privilege to some files. You can read ‘Android Rooting: Benefits and Disadvantages’ first. Then you will need an iPhone Backup Extractor, ActivePython and Whatsapp Xtract tool. Create a backup for your Whatsapp on your mobile phone. Open your Whatsapp and navigate to Settings >> More>> Backup Chats. Install the ActivePython on your computer first, and then launch it. Open the iPhone Backup Extractor on your phone and navigate to net.whatsapp.WhatsApp/Documents/ChatStorage.sqlite. Ensure to create an unencrypted backup with iTunes, as these tools can’t handle encrypted backups. And copy them to your memory card. Create a folder on your computer Desktop and name it Whatsapp backup. Extract the ‘Whatsapp Extract tool.zip’ to the folder you just created. E.g C:UsersComputer_nameDesktopWhatsapp Backup. Run “!install pyCrypto.bat” as administrator, then paste the ChatStorage.sqlite (for iPhone) or msgstore.db and wa.db (for Android) and overwrite any files. Then open the “whatsapp_xtract_iphone” for iPhone or “whatsapp_xtract_android” for Android. 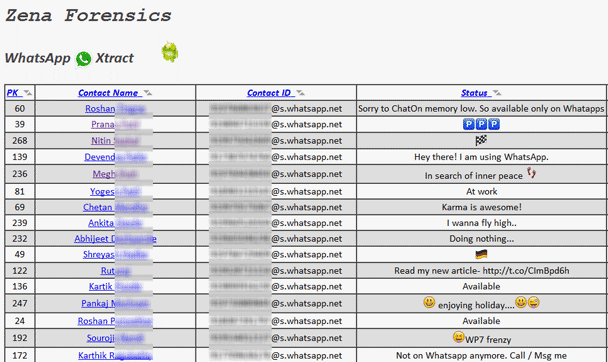 The HTML file from the database will be opened and open it on a web browser to see your Whatsapp conversations. How i hope you can backup Whatsapp conversations on your computer easily. If you have any questions to ask or comments to make, use the comment box below. Remember to share this post with your friends. Thanks for sharing such an awesome article. Now I can save all my conversations THUMBS UP! Transfer your MicroSD card to your new phone, install Whatsapp on the new phone and click yes when prompted to restore your message history. You need an iPhone backup app called iTool to backup Whatsapp on iPhones. Thanks , where can I find itool? Do I download to pc or my iPhone? I got a WhatsApp backup from Nokia 5233 (symbian). Can this program view it? No sir, these programs only read for Android and iOS because your backup format may not be of the same format with the listed phone models. help me i have a symbian file named msgstore.bak, how can i open it?? The msgstore.bak files are somehow encrypted, I don’t know how. But if the Phone is hacked, you can access the “Private” folder in phone memory and copy the Whatsapp program folder from there. It will include the file MsgStore.db, which is unencrypted. However, sadly to say, it’s still a different format than sqlite3. It’s some Nokia-Symbian specific database format and there is no easy way to read it using Python. So I can’t help you now. You may copy the mentioned program folder with the unencrypted databases to have a backup which maybe eventually could be read later. Is it possible to transfer the media on the chats as well ? Yes, everything is on the database so if you transfer the database it will go alongside it. Please show me how to move whatsapp conversations from Samsung phones to computer. I don’t really understand the Android path of this article. Sorry and thanks! Simply launch your Whatsapp and go to Settings > Chat Settings > Backup Conversation and it will be saved on /data/data/com.whatsapp/databases/msgstore.db and /data/data/com.whatsapp/databases/wa.db , navigate to both places and copy the two files and save on your PC. How do i transfer whatsapp convo from a nokia x6? Was meant to read how can i transfer whatsapp chats from my nokia x6 to my laptop? Any help? You can copy the Whatsapp backup from the Whatsapp Folder in your Phone, check your SDcard for a folder called Whatsapp, you will see the backup folder in it. Great for this way. Also here is another easier way for this. iPhone users can extract WhatsApp chats from iPhone and iTunes backup files, and save them to computer. pls I have all my whatsapp database copied to my system, how can I decrypt them and view it on my pc.